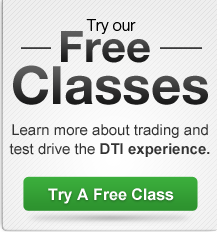 What makes DTI different from other stock, options, and futures trading schools? We trade LIVE and we teach students how to use our unique, proprietary DTI Method to trade stocks, options, futures, currencies, commodities, and other markets. Most trading schools focus on technical analysis, and while we feel that certain indicators are useful in confirming a market movement, we teach you not to be reliant on them. One drawback is most technical indicators do not account for after-hours trading. For instance, a moving average that takes into account after-hours trading can be significantly different than one that only accounts for trading during the day market. Plus, our method is reinforced as we use the DTI Method and the Roadmap™ software to trade live everyday. There is not much more accountability than that! Tom Busby and our DTI trained instructors are some of the very few traders in the world who regularly trade in front of a live audience. Does that tell you something about the power of what we’re teaching and our level of confidence to show you how it works to trade various markets? We provide you with an education experience that is tailored to fit your unique situation. At DTI, we offer a Core Education, Special Focus Classes and Destination Workshops that in conjunction with our 24-Hour Educational Trade Room and powerful RoadMap™ Software let you learn how to trade the markets at a pace that fits you. That’s what we call “Trading at the Speed of You.” It all starts with our proprietary RoadMap™ Profile. The Roadmap™ Profile is more than just a confidential series of questions. It is a scientifically developed tool for identifying the kind of educational experience that will best help you to make your desired outcome a reality. Why is it important to know the DTI Method, whether you trade stocks, options, futures, currencies, commodities or other markets? At DTI, we believe we provide the best market education in the world because of our proprietary DTI Method. Regardless of which market(s) you trade, our method teaches you how to: (1) look at what is happening with a particular market from a 24-hour global perspective; (2) recognize which times of the day, week, or month to trade that market; and (3) identify and understand key market numbers (support, resistance, and pivots). By following the DTI Method, we can show you how to utilize our powerful RoadMap™ software to analyze any market to help you more accurately answer the crucial question of whether to be long, short or out. At DTI, we know that everybody comes to trading with different levels of knowledge, personalities, risk tolerance and goals. Given that, it makes sense to tailor our education to fit your needs. The first step is for you to take 5 minutes to fill out a COMPLETELY CONFIDENTIAL, NO OBLIGATION RoadMap™ Profile so we can assess your strengths and areas of improvement as a trader. From there we can suggest a customized education plan based upon your particular goals, resources, and available time. Do we teach students how to use technical analysis? There are many approaches to analyzing the markets and many technical indicators that can confirm momentum. While we will support you using any indicator you have found to be useful, the DTI Method does not use conventional technical analysis. Our own tools and analysis developed from Tom Busby’s 38+ years of real world trading experience give us the best trading system we’ve found. We trade beyond technical analysis. Why is understanding the futures market important? Whether you trade stocks, options, ETFs or any other market, we believe you will have a more precise edge in timing your trades if you follow the S&P 500 futures. Furthermore, we believe the probability of success increases if each major market index futures including the S&P, Nasdaq, DOW and DAX are moving in unison. From our experience, we believe a lack of divergence in the markets will put a “wind at your back” for an increased probability of a smoother trading experience. What are the 24-hour Global markets? With financial exchanges around the globe, the savvy trader can trade or collect data virtually 24 hours a day. Because other markets trade in the evening and early morning hours before the U.S. stock markets open, they can exert a great deal of influence on evening and early morning trading in the U.S. The 24-hour Global Markets include the Nikkei and Hang Seng in Asia, the Eurex, Swiss, CAC and FTSE in Europe and the U.S. markets. I work a regular job. What should I focus on with learning and trading? We have a custom plan for people who want a better financial future while continuing to pursue their chosen career. At the same time, if your passion is to have the freedom of being a full or part-time trader and setting your own hours, we have totally different trading programs just for you. I’ve been successful in my own business or profession, but every time I trade I lose money. What should I do? We understand your frustration. Some of the smartest and most accomplished people who’ve had successful careers in business or in professions such as medicine, engineering, or law come to our trading classes and find that it’s not as easy as they thought. It takes the proper education, perseverance and a proven strategy to become a consistent trader. What type of customer support should I expect from DTI? DTI is unparalleled when it comes to supporting our students in all matters pertaining to trading. Our open chat within our 24-Hour Educational Trade Room allows you to communicate with instructors and other students alike. Plus our technical support and educational advisers are also available by phone Monday-Friday during normal business hours. We also have available for you a proprietary daily planner. DTI’s Pre-Market Planner is prepared daily by our key numbers expert Chuck Crow to help all students prepare for the trading day. You will receive this planner upon signing up for one of our Core Education classes.